Most newer homes in Idaho (and across the United States) have cavity walls—and insulating them is important. Cavity walls are two walls/materials separated by a hollow space (cavity). The materials are often masonry such as brick or concrete block. Contact Big City Insulation of Idaho for a quote on your Boise project, or keep reading to learn more! Insulation can be installed to help reduce heat loss through a cavity wall by filling the empty space with material that helps stop heat transfer. Cavity walls (in homes and commercial buildings) are often insulated when they are first built—but retrofit installation projects can be completed as well. Cavity wall insulation is usually blown into the cavity from the outside of the house. Keep in mind that it’s always a good idea to ask a professional. Someone on our team can assess your home’s walls and determine the right solution. 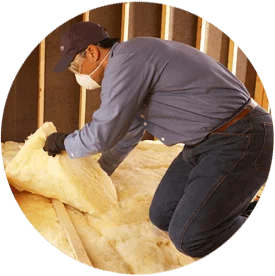 Different materials can be used to insulate cavity and external walls, but spray foam and fiberglass are most often used. Interior and exterior wall insulation can help you maximize your home’s energy efficiency and save the most money. As one of the biggest sources of energy loss in homes, walls should always be properly insulated. Contact Big City Insulation of Idaho to learn more about our wall insulation services or to get a free estimate for your project!